A cap that cools the brain could knock insomnia on the head. Doctors have devised a cap filled with tubes of chilled water that calms over-active minds, allowing the wearer to switch off and get a good night’s sleep. 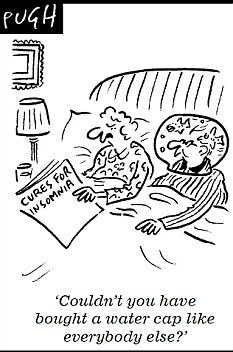 In a study, insomniacs who wore the ‘nightcap’ slept just as well as those without the condition. The US researchers say their gadget could provide a safe alternative to the sleeping tablets taken by millions of Britons and Americans night after night. The cap works by cooling a part of the brain called the pre-frontal cortex, which lies just below the forehead. In those who have no trouble dropping off at night, the pre-frontal cortex slows down, but in insomniacs it speeds up. Cooling it with water appears to allow it to switch off – and a good night’s sleep. Dr Eric Nofzinger, of the University of Pittsburgh, said: ‘The primary medical treatment for insomnia has long been the prescription of hypnotics, or sleeping pills, yet only about 25 per cent of patients using these treatments are satisfied, citing concerns regarding side effects and the possibility of dependence on a pill to help them sleep at night. The study found that insomniacs put to bed with caps filled with the coolest water slept 89 per cent of the time they were in bed – and nodded off three minutes earlier than those who had no trouble sleeping, the American Academy of Sleep Medicine’s annual conference heard. Dr Nofzinger concluded that a large-scale trial should now be carried out to confirm the result. British experts said that the science was sound – but questioned how practical and comfortable it is to turn in wearing a water-filled cap.